Can you love someone you have never seen? Peter describes how we love Jesus even though most Christians have never seen him. How can we put so much hope into someone we have never seen? I think about the time when we were expecting our children. For nine months we had no idea what they would look like. Yet we talked to them and loved them, it didn’t even matter what their appearance would be. Then the glorious day came of their birth, and for the first time we looked into their eyes. A love and joy overcame us that was indescribable for words. When we read this scripture we usually only think about God vs. Money, however this scripture goes deeper than this. If you’re a Christian you probably professed Jesus as your Lord, the Biblical meaning of Lord is Master. Is Jesus really your Master? Its easy to admire and adore Jesus for his wisdom and sacrifice, even most Muslims would acknowledge his greatness. However do you serve Jesus as your Master? Are you devoted to Christ or are you more devoted to your hobbies or career? In the Bible, most of Jesus apostles called themselves a “BondServant” or “Bondslave”. This was a Jewish term of someone who willingly made themselves a slave to a master. Are you a Bondservant to Jesus Christ? Have you surrendered your own desires to fulfill Gods will? Often when we talk like this , people go running for this hills. Because it requires discipline and sacrifice. People often want Jesus to fit into their schedules rather than changing your schedule for Jesus. As Jesus says in this scripture we cant serve two masters. There is only one master truly in your life, question is who or what is it? Becoming a Bondservant for Christ is not easy and the transformation usually doesn’t happen overnight. However it’s a status we should aspire to become and ponder our daily lives as to who are we really serving on a daily basis? Surrender yourself to Christ in Jesus Name Amen! This entry was posted in Jesus on October 27, 2017 by Unashamed of Jesus. Throughout history humanity has left God down, he gave us life, he gave us paradise, he gave us freedom, yet we choose to follow the ways of Satan instead. And during our falls, humanity calls upon God to save them, then goes right back to their sinful and idolatry ways. This was present ever since the beginning with Adam and Eve, also throughout the history of Israel, and even today during the Church age. Humanity can never seem to stay on the right path. And at times God has been pushed and provoked to put his wrath upon humanity. 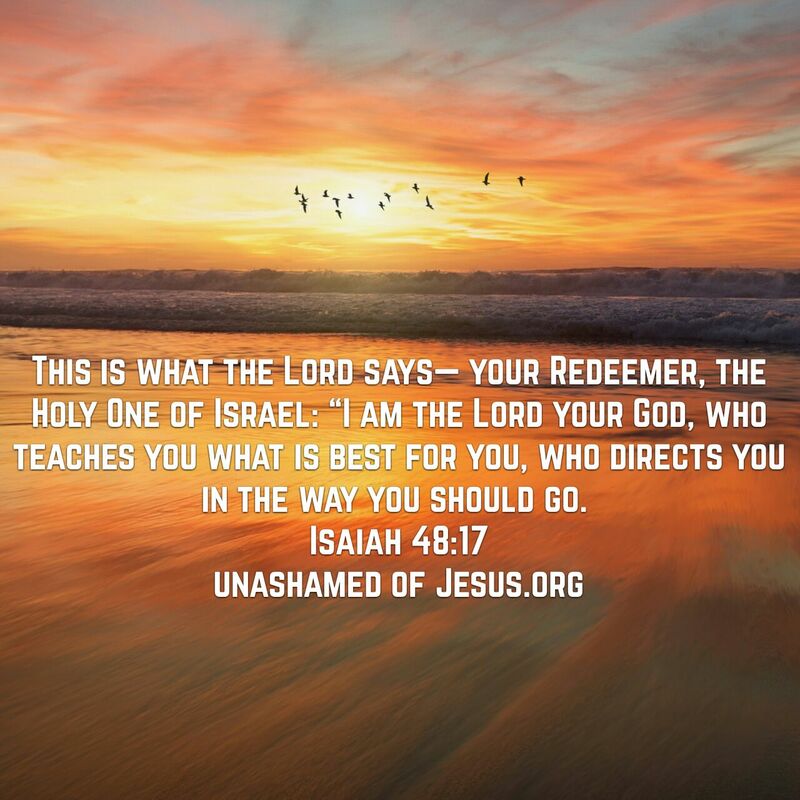 This entry was posted in Jesus on October 25, 2017 by Unashamed of Jesus. Lord , I have heard of your fame; I stand in awe of your deeds, Lord . Repeat them in our day, in our time make them known; in wrath remember mercy. Have you crossed over? When we think about crossing over we think about leaving our current realm or existence and going into a new dimension. This is exactly what Jesus offers us, he offers us eternal life to cross over from our existing life of sin and death. This is exactly what Jesus meant by setting us free, we are free from the judgment of Gods wrath. Some might say that this doesn’t apply to them as they don’t believe in God. Just because you don’t believe in something doesn’t mean its not going to happen. I can guarantee everyone of us will one day stand before God and give an account of our lives. The only difference is are you condemned by the wages of your sins or are you covered by the blood of Jesus Christ? Many people don’t want to talk about this or even ponder it, but this decision will forever seal your fate! Jesus is calling you to cross over, to drink from the living water that only he can provide, the only one who can bring the dead back to life. Trust in Jesus, hear his word and believe in him. Cross over to eternal life in Jesus Name Amen! This entry was posted in Jesus on October 24, 2017 by Unashamed of Jesus. Think about how many people have smart phones today, not only do most people own one, but they don’t know how to function without one. All the knowledge of God is right at their fingertips, the entire Bible can be downloaded from a free app in any language and any translation. This has never been done before in the history of The Church, we are seeing the knowledge of Jesus Christ be spread throughout the world! Jesus commanded us to make disciples of all the nations, how would this been possible in the past? This generation, we are able to fulfill the great commission by using the technology and social media platforms we have at our disposal. There is no more excuse for anyone not to know the gospel of Jesus Christ, but Gods needs you to be a messenger!